I can only get it at special events at my church when they pull out the deep fryer. Or at places where they fry candy bars. 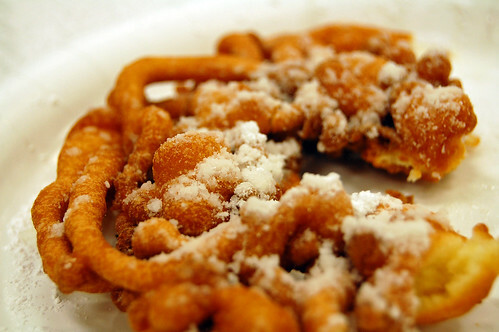 To be honest, I could never eat another funnel cake and I'd be perfectly fine. But I will eat another one. Do you know why? It's the economics principle of supply and demand. As the supply of an item becomes scarce, the demand for that item will drastically increase. With no real regard to the quality of that item. Exhibit A: Girl Scout Cookies. I'm not anti-Girl Scout. I love a sassy sash with some flare. But let's be honest. A $3 box of Do-Si-Dos are not better than a $2.50 package of Nutter Butters. Not by a long shot. For any Girl Scout Cookie, there is likely a better-tasting and much cheaper alternative. Do you know why? Supply and Demand. When we see that order form pop up in our workplaces or in the little hands of a girl outside a department store, our hearts begin to race because THIS IS OUR ONLY CHANCE. A tip of my hat to you girls in green. Oh, my gosh, Jamie! You're riiiight! So true so true, Jamie. I am so guilty. Oh my gosh! You are so right! To think, they look so cute and innocent! I don't much care about the girl scouts cookies now that you've posted a picture of a FUNNEL CAKE!! Sounds a lot like capitalism. We should regulate Girl Scouts immediately. This is getting out of hand.